Not nice to try carve into live moose. Shoulda been a moose gooser. How about them moose goosers, ain't they recluse? Look at them moose goosers, ain't they dumb? Get your gooser loose and rouse a drousy moose! 70 miles per hour at 22 below! And you may think I'm a fool. 'Cause I'm frozen to the stool. Edited: I'm trying to attach a pic here. You can click on the attachment until I figure out how to paste it into the post. Working on a few modifications to the RV and the delivery/installation of a hitch for the truck before we can hit the road again. Lena and Jenny and Jenny's boyfriend are having fun in Sweden. Skiing, and ice skating. Jenny and BF are going to go in a sauna and then jump in the water in a hole in the ice. I haven't gotten a report from that yet. Congratulations on your new "toys"! I'm sure they will provide many happy miles on the road in the years ahead. 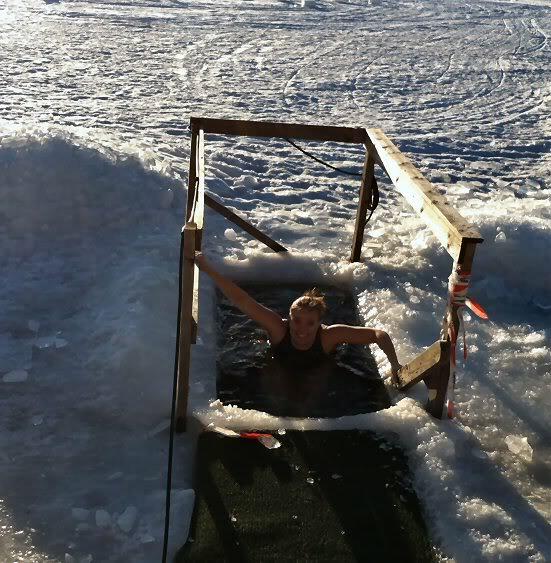 Jenny and BF are going to go in a sauna and then jump in the water in a hole in the ice. I haven't gotten a report from that yet. Would that be the "Shrinkage Report"? Today I went to Zumba . I hate to exercise but this class I love . It is 60 minute of Latin dancing with exercise moves . The time just flies by and it is not boring . It exercises every area of your body plus cardio . So if your gym offers it try it ! It's great ! Lots of rubbernecking, almost ran over a fat stripe on the road - managed to straddle it with the car, then turned around and came back to be sure all was ok. He wasn't to be troubled by moving, so I went down, turned around, and came back behind him. He still didn't feel the need to bestir himself till I sprayed a mouthful of water on his tail. At that point he turned his head and gave me a nasty look (much like his normal look). That encouraged me to close the car door and head off to give him some privacy. and here is a picture of our class ! Great poses. Looks like the guys were no shows. Some of those women have had dance training. Really clean, hard poses. I helped my daughter move from her apartment to her townhome today. She does not have a lot of furniture, but it still took three trips with the smallest UHaul moving van. Good thing the distance between the two places is only 2 miles. It's a women only gym so no guys ! He still didn't feel the need to bestir himself till I sprayed a mouthful of water on his tail. Sez the man who - on purpose - goes out and floats around in a whole bunch of water too deep to stand up and breath in. Doing this on a bit of Styrofoam while waiting for the water to get well out of horizontal so he can attempt to stand upright on said bit of flotsam. Madness. You know - the guy who lets his daughter and random strangers try to kick his head off - better, PAYS someone to beat on him and provide rooms for said head kicking. Inexplicable folly. Please note that actions taken during active duty military service are not mentioned - it would be a small man who would comment on the fate tempting audacity of choosing to enter a metal - metal! - tube full of radioactive material and then sink hundreds of feet below the sea. Intentionally. Down and down into the dark crushing deep...., but again, actions taken in service of country are off limits to this discussion. I would have you note, Mr. Nords, that the snake got it's tail sprayed. I did not spit in it's eye. That would have been silly and dangerous. Safety first. Now. Hold mah beer and watch this. Edit. And now just read this: "A few days later I went into an REI store to outfit myself properly with the remaining gear needed for our upcoming Haleakala hike (no REIs in Hawaii)-- 70-liter backpack, water bladder, pack cover, rain poncho, to the tune of $400". The first time wasn't enough?! The caretaker of the hole in the ice said that the real tough guys go in the hole without going in the sauna first, so that's what Jenny did. 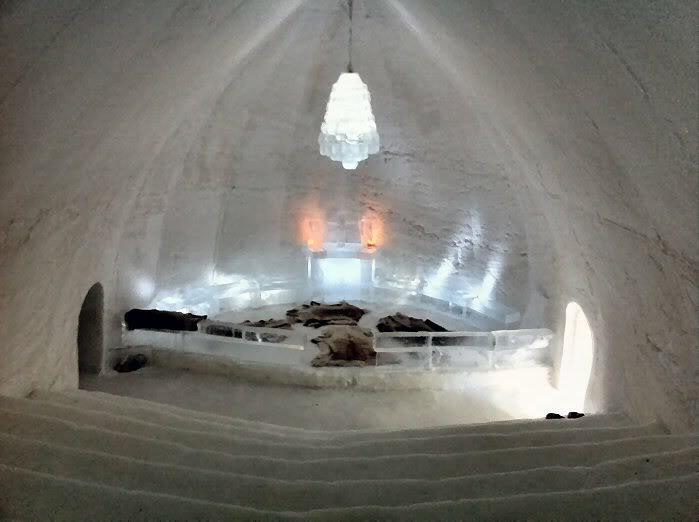 This is an ice hotel.